On Friday 3rd. 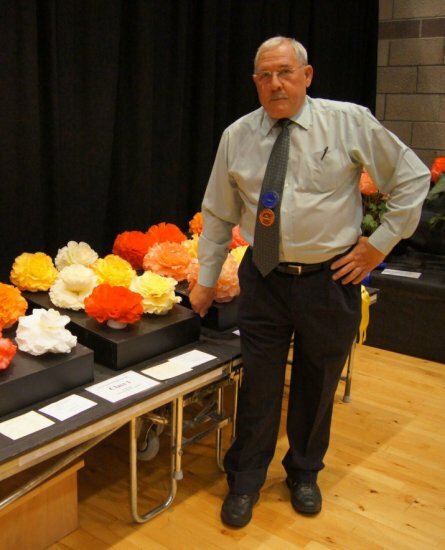 April 2015 Jim Evans came down from Clackmannan, Clackmannanshire Scotland to Chorley to give the North West Area a talk entitled “Hybridising Double Begonias – Seed to Bloom” he was accompanied by Ian Donaldson and John Hamilton. 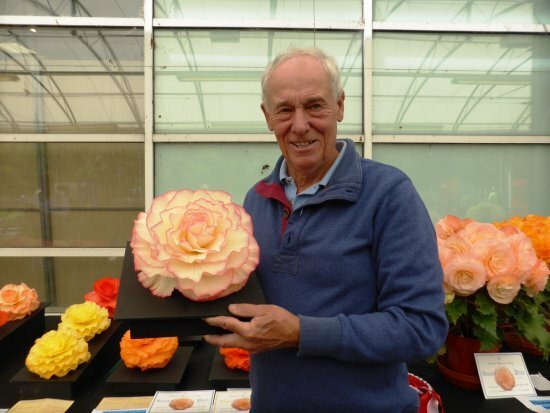 Well it was a fascinating talk and presentation and if I had to pick my top 5 favourite Begonia talks I have been present at over the years, this one without doubt would be in there. What it did was well and truly wet my appetite to try my hand at Hybridising this year. 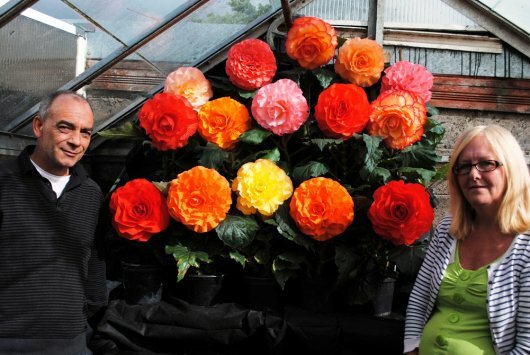 • Robert and Alan Bryce told me on more than one occasion it’s a great feeling seeing something new growing in your greenhouse…. • Jim Evans told me that to truly understand a flower try hybridising…. 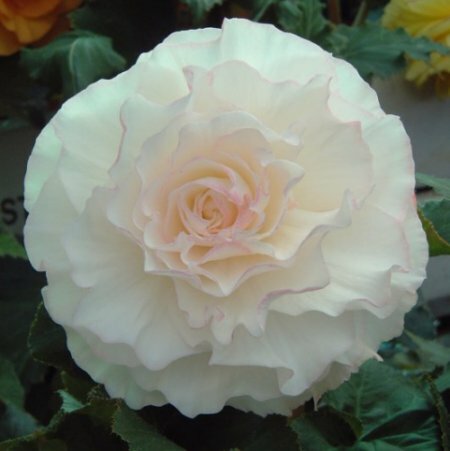 Over the decades I would not be surprised if every half decent looking Double Tuberous Begonia has been crossed at some point or another. It would be interesting to see what crosses have led to some of our best known flowers for Cut Bloom work or Pot plant work but as far as I know that is not available unless you know the hybridiser of a variety and you are not afraid to ask the raiser the question. Over the last 20 years I would say that most of our “best” new raisings have been done by amateur growers like Alan & Robert Bryce, Dave Coates, and John Hamilton (they will have to forgive for calling them that). The picture to the left is of Dave Coates with one of his new seedlings and to the right one of Alan Bryce’s seedlings. I know that it’s going to be hit and miss to get pollen from certain varieties as nothing is certain or guaranteed when it comes to hybridisation. So my plan this year was to take cuttings around June from what I class as the best varieties I have for Cut Bloom work. 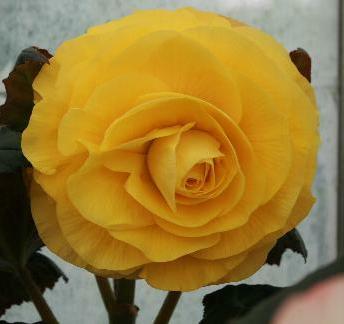 I know the colour I want to try and hybridise and that is a proper golden yellow (like a pure daffodil golden yellow) that will make a reliable cut bloom with good depth a proper rose bud centre and grows to a good size. 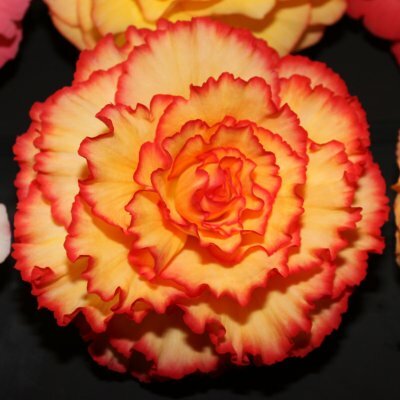 The other quality I want in the flower is a wavy petal rather than a straight forward plain petalled flower. I have cutting tubers of the following varieties which I could use to get the female f lower on. The following varieties I took cuttings from to try and get some pollen on the male flower, Golden Hind, Alana Hamilton (left), Yellow Bali Hi (right) and Can Can (the latter two have a vibrant yellow colour). 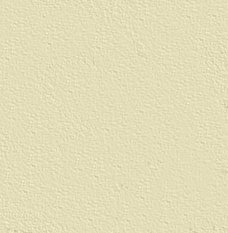 However after a little research I have found what varieties have produced variations of the colour yellow in the past or posed problems. I did ask Robert Bryce about using Yellow Bali Hi for the yellow as it’s a striking shade of yellow however he told me that he had never known this variety to give pollen. 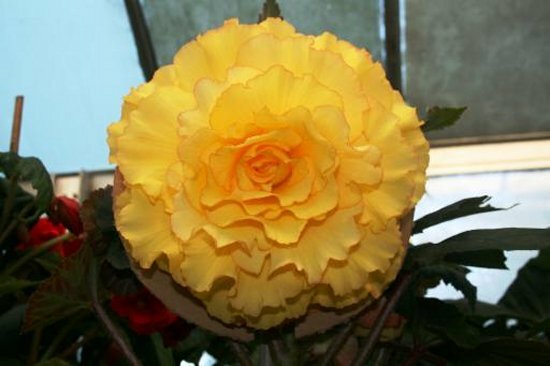 At the Scottish Begonia Meeting I had a quiet word with John Hamilton about what I wanted to try, and he suggested crossing x2 yellows or a yellow and orange – the yellow he suggested was Joan Bryce and the orange was Tequila Sunrise. • Step 1 - obtain a cutting of Joan Bryce. • Step 2 - This was harder, trying to get the cutting rooted. • Step 3 - I had to get the rooted cutting of Joan Bryce to produce pollen!!!!!!! During June and early July I took a number of cuttings of certain varieties and rooted them in individual 2inch square pots in coir and then sat them in one of my propagators with a little bottom heat. I left them like this to root, the only thing I did was water them and nothing else. I basically wanted them to feel that the only way that they would survive is to “reproduce” – produce pollen. See the picture on the left showing cuttings I have earmarked for trying my hand at hybridizing. The hotbox I was using was set at 15°c (approx. 60°f) just to add a little bottom heat and to ensure I was not going fail because it was too damp and cold. By the end of June I had x3 cuttings of Joan Bryce rooted and x2 leaf cuttings. Now you have an idea where I am starting from, where it ends and how far I get I don’t know but you have start somewhere. Now Moria Callam has been raised, named and released by John Hamilton I wonder what would come out, if you crossed Moria Callam with Joan Bryce – you would think it would be a yellow!!! Now those who work with me know I can be stubborn or pig headed at times (they would properly say more often than not if I am honest) so with that tendency I am still going to try and hybridise using Yellow Bali Hi, just to try and get that fantastic show stopping shade of Yellow out of it and into a solid colour flower – so what would happen if you went for pollen of Moria Callam or Joan Bryce and put it over Yellow Bali Hi and I have not brought Monica Bryce into the equation yet. At this point I would like to thank, Jim Evens, Robert Bryce (left) and John Hamilton (right) for their help – and trust me I have asked some “daft questions” which will be detailed in the second part of this instalment. Hybridising part 2 – Going for seed - coming soon….